Become the White Death and send chills down your enemies' spines. Unleash terror with the Wintestorm, Piercing Frost, and Biting Blizzard weapons, and scare all in your headlights with the Ghastly Skull buggy. The White Death Bundle includes a new character outfit, a new buggy paint job, and blueprints for three new weapons: a long knife, a machete, and a rifle. 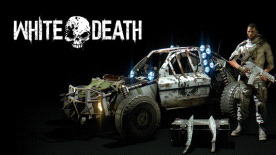 Note: Buggy paint job requires Dying Light: The Following expansion pack. DYING LIGHT © Techland 2017. Published and Distributed by Warner Bros. Home Entertainment Inc. WB SHIELD: ™ & © Warner Bros. Entertainment Inc.